Pro Tools | Is The Gamification Of Music Software A Good Thing? Is The Gamification Of Music Software A Good Thing? Sometimes when I’ve been having a frustrating day dealing with audio software I’ve joked that I can’t perform the action I want to because I’ve forgotten to collect the golden key from the wizard guarding the entrance to level 12. When dealing with buggy or badly designed software you can feel like you are pitting your wits against a faceless software designer, completing arbitrary, unnecessary actions in order to outwit this cunning software adversary. I’m exaggerating but I’m sure we’ve all been there. What I’m referring to is the frustration of using bad software, whether that software is a DAW or a game. The feeling that you are jumping through an arbitrary set of hoops to achieve a goal rather than completing the steps necessary to achieve that goal. Well designed software really shouldn’t “get in the way”. I should declare myself here: I’m not a gamer. I have played games in the past and I’m not sure they suit me. I either get bored quickly or, far worse, get into it and experience what I imagine a serious drug problem must be like, with all the same mechanisms of addictive behaviour being carefully manipulated by the designer. Games are, on the face of it, a difficult sell: Buying a game costs money and uses the player’s time in return for nothing. So should creative software - i.e tools for work, borrow ideas from computer games i.e. tools for play? One of the principal jobs of computer game designers is to design user interfaces which are easy to use. If you can’t defeat the big boss at the end of the game because of the interface then this isn’t good. Being able to access features easily and quickly, monitoring and controlling multiple objects simultaneously and allowing the elusive “immersive experience” are all high on the list of priorities of all software designers (other than whoever designed Word apparently…). However I do notice more and more elements of audio software which feel like they have come straight from the latest big games title. Gamification has become something of a buzzword, an acknowledgement of the innovative work which has been done in game design and seeks to transplant elements of that work into “serious” software. Usually gamification refers to attempting to incorporate some of the social and reward aspects of gameplay into other settings. Some of these are rather crude attempts to “gamify” incentives and goal setting, often for sales teams, trying to make sales even more competitive (if that were possible). So should music software be trying to be more like Call of Duty than, as the current trend seems to be, Facebook? An aspect of DAWs and music software more generally which appears to me to borrow from game design is the accumulation of “shiny new things”. This is hardly new. It is no secret that offering lots of toys is a surefire way of getting the attention of the first-time user of a DAW. Expliotation of our aquisitive side, our desire to have new things, is a mainstay of computer games design. Gamers know how important good graphics are. While you could argue it shouldn’t matter in an audio product, the same goes for the look of a UI. A well implemented waterfall display certainly attracted lots of attention for Insight and Razor and all drum VI’s now feature gorgeous renderings of the kit complete with animations. The most striking example of this I have come across is the ZGameEditor Visualizer in FL Studio. This plug-in creates VJ style graphics responding to MIDI and audio from the DAW. Reminds me of playing Wipeout on a Playstation One in 1995! More and more music software seeks to balance depth of features and the interests of experienced users with the desire for instant results and instant gratification. While we’ve had presets, templates and libraries for a long time, dedicated easy and expert modes are available in Logic X. In gaming, setting the level of difficulty has long been a feature. The proliferation of signature series and one knob plug-ins from Waves arguably provide shortcuts to an end result in a similar way to some of these “easy” features. Toontrack’s EZ line of products don’t try to disguise their potential for getting the results without the hard work. A “cheat code” for music production? 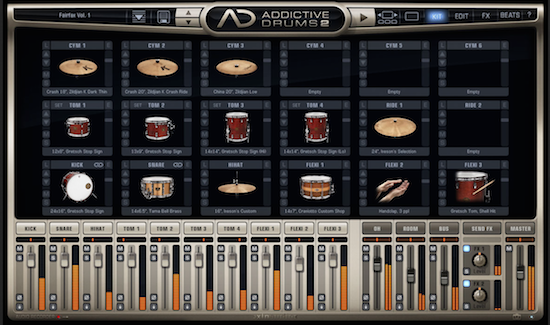 The thing which first got me thinking about this was the new drummer feature in Logic X. Selecting your drummer echoes selecting your fighter/driver/whatever in computer games so closely. I’m sure its very appealing to new users. The in-app purchase model from gaming has migrated very successfully to some areas of music software. T-Racks being a very visible user of this model. The use of online collaboration and social networking isn’t a feature from gaming per-se but is an area which has been implemented widely in both gaming and music software, from Studio One’s Nimbit to Avid Everywhere. While the value of some of these features has been questioned, one example of a feature which has been very well recieved as fun, useful and allowing the sharing of content from users and celebrity endorsees alike is TC Electronic’s Toneprint system. The language we use to describe our tools is quite revealing. We all talk about getting new toys to play with instead of getting new tools to work with when talking about studio gear. This sense of fun and discovery is part of the creative process. Audio software is different from a corporate database, it’s supposed to inspire, and appropriate use of a presentation borrowed from gaming is appropriate. 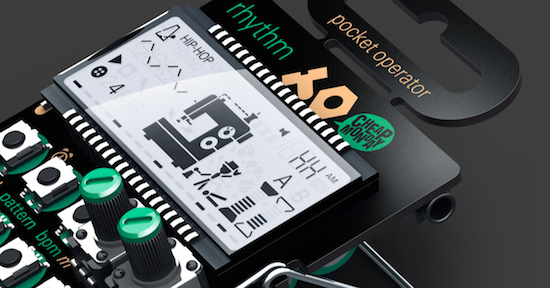 I’m noticing more elements of game design in hardware too, the most obvious examples being the new Pocket Operator from Teenage Engineering. I’m not suggesting that elements of game design don’t belong in professional tools, far from it. Well concieved and executed borrowings from game design enrich and improve our tools. Are there examples of software which gets this spot on? Any which are adding features which detract from the product? While software developers can’t please all the people all the time, are any creating products which crossover from toy to tool (or vice-versa) and getting it just right?